Apply Today for Sugarloaf Fine Arts Camp! Sugarloaf is an overnight summer camp with two one-week camp sessions that run Sunday-Saturday. 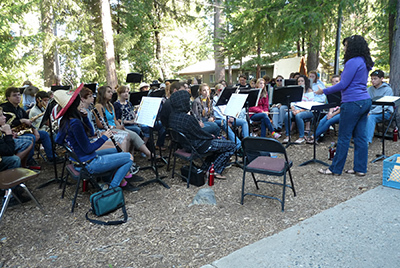 Campers live at our camp facility located at the beautiful Sly Park Environmental Education Center in Pollock Pines, California. Online applications for the 2017 Sugarloaf Fine Arts Camp sessions are available February 1 – February 15, 2017. For families without computer access, the El Dorado County Library and the El Dorado County Office of Education (EDCOE) have computers available for your use. EDCOE team members may also enter camper registration information upon request. Please contact EDCOE, if you need assistance at (530) 295-2253. EDCOE is located at 6767 Green Valley Road in Placerville. Campers in performance majors including Music, Theatre, Chorale, A Capella, and Dance must be able to perform with their major on Saturday, the last day of their camp session. Campers who are not able to perform on Saturday may not enroll in performance majors. Missing a final performance will disqualify students from further Sugarloaf attendance. Sugarloaf Fine Arts Camp is open to students who will have completed grades 5-11 by July of the camp year. The Sugarloaf experience gives children a unique opportunity to explore their interest in the visual and performing arts. Classes are focused and directed by excellent instructors. Campers not enrolled in majors that require attendance for both the first and second class periods of each day have the opportunity to take an elective class where they can further develop their skills or try something new. Sugarloaf is administered by EDCOE, and El Dorado County students receive priority for registration. Once classes reach a designated enrollment level, out-of-county applicants are also considered. Students are accepted through a randomized process. Majors have maximum enrollment levels, and students may be given their second or third priority if space is not available in their first choice. Unfortunately, due to the limited number of spaces available, not all who apply will be admitted to Sugarloaf. The Sugarloaf Foundation raises money for student scholarships. Families who need financial assistance can apply during the camp application process. The Foundation’s website, has information on scholarships and how to support Sugarloaf campers by donating to the Foundation.